We were lucky to find a number of nice Luang Phor Tuad amulets on this recent trip across the country to find authentic amulets at Thai Buddhist temples (Theravada temples). Below are some of the LPT amulets we found and have in stock today. If you are interested in purchasing some of them, just email us at the address found at the bottom, after our amulet collection. This is a new color scheme for a Luang Phor Tuad Jatukam style amulet from the temple. We found this in a bag of Jatukams that was under the counter. We insisted it was under there, but they didn’t believe us until they looked. We remembered exactly where it was from the previous time we bought amulets there about a year ago. Sometimes they are resistant to sell their Jatukam amulets at the Wat Mahathat temple because they realize they are becoming more and more rare. This means we have to redouble our efforts to find them and offer them here before the good ones disappear. You can have this case, or let us know to change the case to a traditional stainless steel silver case and we’ll do that at no cost. Item #JATBLU7. $69.95. This was an unexpected find, an oval shaped silver (pewter?) Luang Phor Tuad amulet with a nice gold case. We have never seen this amulet before, but more importantly, nothing like this style of Luang Phor Tuad before. We only have a couple of these. Item #LPTOVAL7. $69.95. Another stunning color scheme on this LPT Jatukam amulet from Wat Mahathat in Nakhon si Thammarat, southern Thailand. Again, this case can be swapped out for a traditional solid stainless steel case, which you might prefer to this gold plated one. Item #JATBLY8. $69.95. Silver, red, pink, blue Jatukam Luang Phor Tuad amulet in an ornate gold plated case. This is another unique color set we haven’t seen before. I think we have 3 of these amulets available now. If you like any of these on this page, purchase now because our Jatukam style amulets have been going so fast and we won’t be able to purchase any more like this once they are gone. Item #JATPRB2. $69.95. Waterproof brass Luang Phor Tuad turtle amulet. Item #LPTBTRT2. $19.95. This was another great find, we have never seen this amulet offered anywhere. This is a tricolor Luang Phor Tuad oval amulet set in a gold plated case. The reverse is intricately designed as well. One of our best LPT amulets! We have 2 of these. Item #LPTOV55. $$79.95. This one we have offered before. It is a bronze figurine Luang Phor Tuad amulet set in a gold plated case. This is a heavy pendant that may not be all that comfortable to wear, but could be better placed on a shrine with your Buddha or other historical Buddhist figures. Item #LPT744. $34.95. Let us know your Paypal account email address so we can send you an invoice for the amulet(s) you want. We do not have these amulets up on our website yet, with the exception of LPT744 which is on our Luang Phor Tuad amulets page here. So glad we went to the temple today – at Wat Tham Seua because we found a LPT – Luang Phor Tuad (Thuat) amulet like we haven’t seen there before. We have seen a cheap copy in Bangkok at a street market one time, and they wanted 9,900 THB. The detail was missing, so we knew it was fake right away. This one is genuine – there is a lot of detail and the case seems made for the amulet. This is how an LPT amulet looks like when made at the temple. We purchased it and asked for more – no, no more. They only found this one in the back with their amulet supplies and didn’t have anything else to sell like it. I love when that happens – when we are able to find a rare amulet and there are no more to buy either. That means people are saving them at home and there won’t be a group of them for sale, just every now and then. That keeps the value high on this amulet. We will put it up at our main site at this page – Luang Phor Tuad (Thuat) Cutaway Shield – but maybe we will sell it here on this page too fast to do that. This is what usually happens with the good amulets. This is an original and not a copy. Found at Wat Tham Seua (Tiger Cave Temple) in Southern Thailand’s Krabi Province, and Krabi Noi Subdistrict. Luang Phor Tuad is a very well known and revered Theravada Buddhist monk and we don’t have too many high-end amulets for him. Case: Plastic Waterproof and heavy duty. Availability: Rare, we have never seen this amulet at this temple, and only rarely in other Temples. Rent: $399 USD (~14,000 THB) SOLD OUT – SORRY! 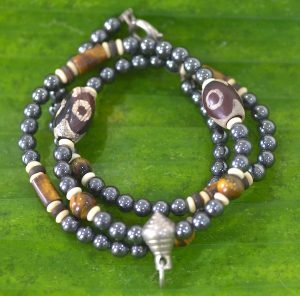 Includes: Free Necklace, blessed Buddhist bracelets, and shipping with tracking worldwide. Use this CONTACT FORM to let us know if you want this amulet before we put it for sale at our main ThaiAmuletSales.com site. This is among our best designed yant cloths (flags). Luang Phor Tuad is Thailand’s best known monk, and probably the most popular monk across the globe from Thailand. We came upon a newly designed yant cloth for those of you that like to hang them on your Buddhist shrine, in your cars off your rearview mirrors, or in your home on a wall in a special room. This is a bright gold yant flag, I don’t remember that we’ve ever had this exact style before. The cloth is like felt on the front, and like silk on the reverse side. This Luang Phor Tuad yant comes from Wat Tum Sua, Krabi, Thailand in the southern province of Krabi. We only have about 8 of these, and when they go we don’t expect to be able to source them again at the temple. If you have been a customer of ours in the past, you probably have heard that the temple chooses what they make based on what Thais buy the most. Often times it differs from what we sell most on this website to people across the world. This yant is not on our YANTS PAGE, and won’t be, we just don’t have enough of them to make it worthwhile to post them over there too. 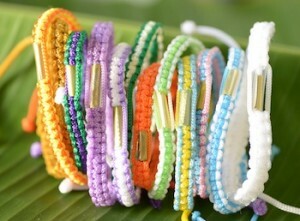 The cost for each yellow yant is just $12.95 and includes free shipping and a couple of blessed Buddhist bracelets, also from this same Krabi temple. Luang Phor Tuad at a small wat on highway 4 leading into Krabi town, Krabi province. Luang Phor Tuad is a famous Thai monk that was one of the smartest and accomplished monks of his generation. The Thai people identified with Luang Phor and hold him in the highest regards. His amulets are some of the most sought after, and you can see hundreds of (1000’s of) statues and images of Luang Phor all over Thailand. There is a story about how he was able to dip his foot into the water during a draught from a boat and turned the salt water of the bay into drinkable freshwater for those on the boat. Sometimes you will see Luang Phor Tuad in a sitting pose similar to this, but with one foot dipping down to touch the water to commemorate the event. Our LUANG PHOR TUAD AMULETS are here, just click!